When I read this blog the other day, I remembered my silk goody pack. I was inspired to go get it out and look through it once more. 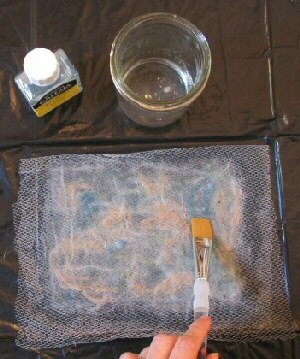 I also pulled out some dyed silk noils sent to me by my friend Heather, who lives in Manitoba. 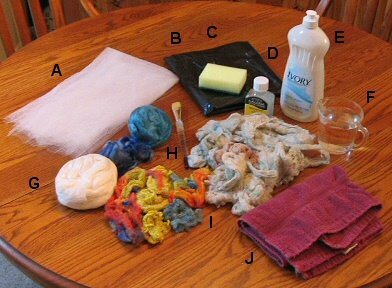 A - netting, B - plastic to cover my work surface, C - sponge for soaking up excess water, D - acrylic gloss medium, E - dishwashing liquid, F - cup of warm water, G - various silk tops, H - small, soft artist's brush, I - variety of hand dyed silk noils, J - towel for hands, drips, whatever. 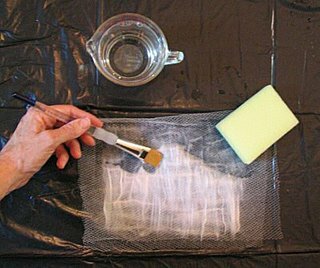 The netting was folded over and the entire thing wetted thoroughly with a dilution of 1 teaspoon dishwashing liquid in 1 cup of warm water. After embellishing, the netting is folded over once again and the entire thing rewetted. The sponge was used to mop up if I used too much water. Next, a 50/50 mixture of acrylic gloss with water was brushed over the entire thing. Ideally, I should have had a drying rack or screen to place this on but I didn't. I set it aside on a clean, dry towel and turned it occasionally. Left: I used my blue silk tops and embellished with some leftover throwsters waste which I had dyed. 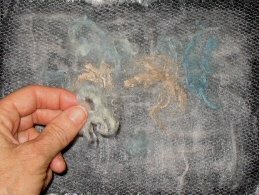 Middle: Blue silk tops as a base embellished with silk noils. Right: This one is of silk noils entirely. I teased them out to make several layers. I allowed them all to dry overnight. I put the complete set of my silk fusion project photos on my Flickr Photos. 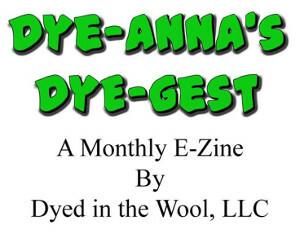 At this point I have no plans for my masterpieces, except to keep as samples or perhaps use as insets in greeting cards. I can see where I made some places too thin and some too thick. There are some areas which could have used more the the acrylic mixture, but even so I am happy with them. These were all quite spontaneous but I can see the potential for more thoughtful designing. 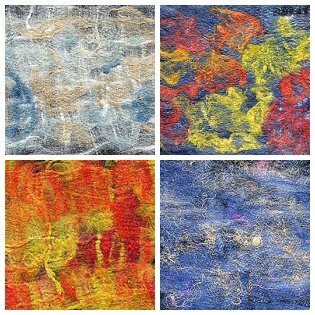 If you want to see some beautiful silk fusion and projects made with it, spend some time exploring Sue B's blog. Her's are inspirational! Wow, those are beautiful...I'm sure anyone who got a greeting card inset like that would love it!!! I'm on DH's computer while mine is being worked on. No favorites, no email addies..... Putyour blog name into Google and up it came! 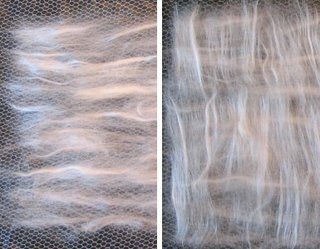 I think about trying silk fusion from time to time, but am not sure what I would do with it. Yours' looks nice. Are you going to try more? Here's hoping my password, etc. works! What a beautiful use for silk, one of my favorite fibers! Thanks for visiting! Very pretty, Leigh? 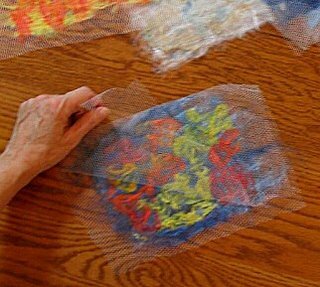 Would you be able to use it for clothing embellishment, or does the acrylic make it too rigid? Good question, Charleen. One of my samples is fairly stiff, but the others aren't. I guess it would depend on what type embellishment. Actually, I like your idea quite a bit. Crazy quilt type squares maybe? I'll have to add it to my ideas to consider. OHHHHHH silk my weakness I have always wanted to try this... looks like paper. Just beautiful. Nice tutorial! I need to try this. Thank you for commenting on my blog, and for telling me who brought you there--I really appreciate that.